The anchor restaurant has finally dropped at Platform in Culver City. The Cannibal, a New York transplant that focuses on butchery, craft beer, and cycling (??) is officially open for dinner serving creative twists on charcuterie classics like matcha chicken liver mousse and a cochinita pibil-inspired head cheese. Or, during the daytime, stop by the butcher counter for lunch to grab meaty sandwiches like the pig’s head cuban and spicy meatball with kimchi marinara. Don’t forget the housemade chicharrones. 8850 Washington Blvd., Culver City, 310-838-2783. The newest player in Downtown’s burgeoning taco game has been garnering buzz for their innovative takes on the classics. Longtime hospitality veterans Jon Blanchard, Chris Blanchard, and Nico Rusconi transformed a 700-square-foot space into their own personal taco lab, topping an Ensenada-style fish taco with Caesar salad and creating a vegetarian version of chorizo using cauliflower. The tortillas are coming from renowned tortilleria La Princesita, and the aguas frescas—like watermelon cinnamon and lavender canteloupe—are all made fresh. 728 S. Olive St., Downtown, 213-896-0373. Silver Lake has got it good these days, what with a new 365 Market by Whole Foods and this pretty new seafood destination opening in the same week. The enterprise comes from Beau Laughlin, former head of Cardiff Giant Hospitality, which brought us such spots as the Churchill and the Hudson, as well as partners Brett Cranston and Jay Milliken. Here, things are focused squarely on the food, which skews pan-coastal and comes from chef Alex McWilliams and sous chef Joel Weidl (formerly of Egg in Brooklyn). Expect soft shell crab sandwiches on black bread, salt cod brandade, sweet corn and razor clam chowder, and skate wing with yam fries—so yeah, seafood. Brunch will launch soon, and there’s a Clover juice bar from the same gang right nextdoor. 3709 W. Sunset Blvd., Silver Lake, 323-641-3709. It’s been almost a year since we first noticed a little taco spot opening in a former auto body shop on the edge of up-and-coming Frogtown. It’s finally here, and so far the only thing up in the air is if it’s more of a destination for its Sonoran-style grilled meats, its wines, craft beers, and cocktails made for patio pounding, or its palm-shaded terrace. The man behind the wood-fire grill is none other than Mexicali co-owner Esdras Ochoa. Co-owner Billy Silverman was hoping to capture a bit of that Austin outdoor vibe, and threw in plenty of loungey seating and fire pits to encourage lingering. 2490 Fletcher Dr., Frogtown. It’s one of the hottest restaurants in town. Get it? Hottest? Like, hottest. It’s a double-meaning, because they serve Nashville hot chicken, but they’re also massively popular. Ahhhh, you guys get it. Dad jokes aside, chef Johnny Ray Zone’s chicken shack has had massive lines snaking throughout Chinatown’s Far Eat Plaza ever since the doors opened, proving that the Music City magic has only increased since he parked the food truck for good. 727 N. Broadway #128, Chinatown, 213-935-8399. This Little Tokyo newcomer is serving up Mediterranean-ish small plates and craft cocktails to the late-night crowd. Chef Duke Gervais, formerly of Pizza Antica, us using those oven skills to top pies with unusual combos like charred octopus with radicchio cream sauce and chorizo arabbiata with shishito peppers. Cocktails are serious business here, so don’t shy away from the likes of the Smoky Negroni, which subs in mezcal for gin. 243 S. San Pedro St., Little Tokyo, 213-947-3329. Papi Chulo is back at it again with a renewed sense of taco vigor, and the fine people of Palms are reaping the benefits. The Kogi brick and mortar is way more than just a food truck sans wheels: Choi is cooking up a menu of taqueria classics like carne asada, pollo asado, and carnitas (you can get them in either taco or burrito form) alongside the old fusion standbys like the Blackjack Quesadilla and calamari taco with gochujang. 3500 Overland Ave., Palms, 424-326-3031. This glitzy and impressive restaurant is combining the Golden Age of Hollywood with modern farm-to-table culinary sensibility. The kitchen is helmed by chef Greg Bernhardt—he was previously at Church & State and Neal Fraser’s Grace, among other spots—and the food leans rustic with some heavy L.A. embellishments. Eat gochujang-spiked beef tartare and coal-roasted carrots while lounging in one of the city’s most impressive dining rooms. 6115 Sunset Blvd. #100, Hollywood, 323-544-9430. Flour tortillas are back in style, and they don’t get much better than the chewy, blistery ones at this new Baja-inspired taco joint. 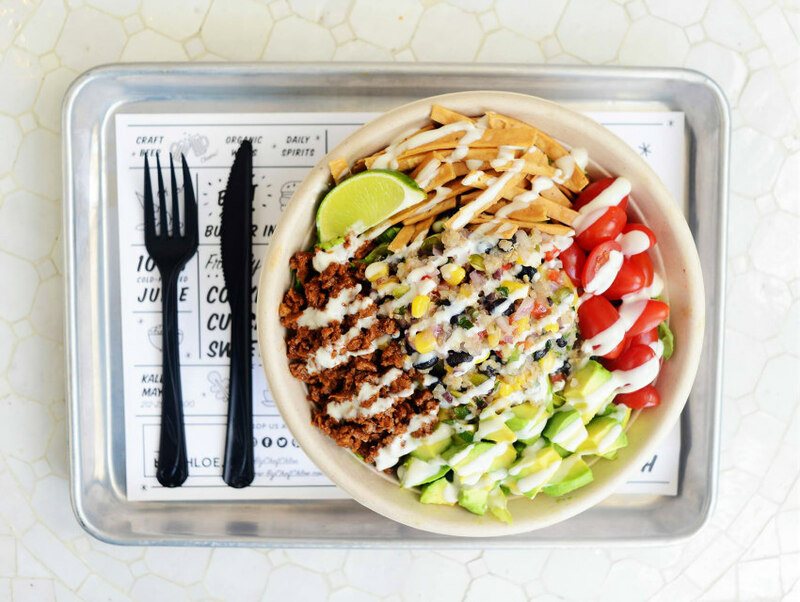 Co-owners Ari Ampudia and Cameron Wallace, a former baker at San Francisco’s Tartine, started Loqui as a pop-up featuring Northern Mexican-style carne asada tacos and they’ve found their permanent home at the new Platform development in Culver City. The Westside’s taco scene will be forever grateful for it. 8850 Washington Blvd., Culver City.